Here is a cute newborn gift set for boys featuring his first teddy bear and a soft white fleece hat that we can personalize with his name! 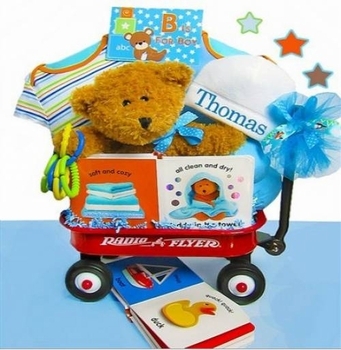 This mini wagon is then filled with a teddy bear book, soft scratch mittens, a teether and two cotton outfits. Once he is big enough, he will be using the little radio flyer wagon for lots of practical playtime fun and transporting his toys. Our client called us to say how much she appreciated this gift we sent to her. I did not see it myself but she always tells it like it is so if she was impressed, it must be great! Adding the baby's name really added a nice touch and the teddy bear is adorable. Very cute baby boy present.